The PLO's chief negotiator, Saeb Erekat, has described the leak of confidential memos documenting a decade of Middle East peace talks as a "slander campaign" and insisted that no single concession will be agreed without a comprehensive agreement with Israel, whose colonisation of Palestinian land is the "only constant". 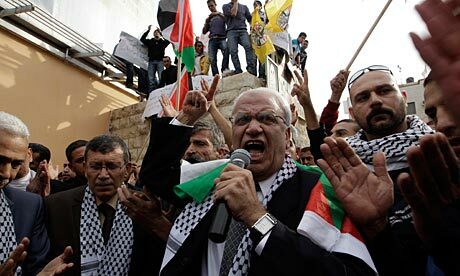 Writing in today's Guardian, Erekat rebuffs accusations that he has been involved in "backdoor dealings" with Israel, but fails to repeat his previous claim that the documents – obtained by Al-Jazeera TV and shared with the Guardian – are "a pack of lies". He says the lesson that should be drawn from the documents is that the Palestinians are serious about peace. "What should be taken from these documents is that Palestinian negotiators have consistently come to the table in complete seriousness and in good faith, and that we have only been met by rejection on the other end," he writes. "Conventional wisdom, supported by the press, has allowed Israel to promote the idea that it has always lacked a partner. If it has not been before, it should now be painfully obvious that the very opposite is true. It is Palestinians who have lacked, and who continue to lack, a serious partner for peace." He underlines that any solution agreed in negotiations must pass a Palestinian national referendum – though the documents reveal him admitting that it will not be possible to hold a vote outside the West Bank and Gaza, which would leave millions of refugees in Jordan and Lebanon unable to take part. Evidence from the papers shows Palestinian negotiators agreed privately in 2008 to let Israel annex all but one of the settlements built illegally in East Jerusalem and accepted the return of a symbolic number of 10,000 refugees to Israel. "Nothing would be agreed," Erekat writes, "until everything is agreed". The papers also show the PLO working closely with Israeli security forces to target Hamas and other militants. Publication of the Palestine papers has generated angry reactions from Palestinians, especially the PLO's Islamist rival Hamas, which advocates armed resistance and will only negotiate with Israel on a long-term ceasefire. The latest revelations show Tony Blair, envoy for the Quartet, was perceived by PA officials to have a pro-Israel stance and to advocate "an apartheid-like approach to dealing with the occupied West Bank". A spokesman for Blair said today: "There has been real change on the ground as a result of Tony Blair's efforts. The economy is now flourishing in the West Bank with double digit growth and falling unemployment. Palestinians are now able to move in the West Bank in ways impossible when Tony Blair started pushing for changes in the access and movement regime." Other papers describe how the Palestinian president, Mahmoud Abbas, tried to persuade a Palestinian businessman to contribute millions of dollars to a radio station for the Iranian opposition after the country's presidential elections in 2009. Abbas's move was cited by Erekat in a meeting with the US Middle East envoy George Mitchell as evidence of the PA's support for US goals in the region, especially its attempts to counter the influence of Iran, which finances Hamas and Lebanon's Hezbollah.